While the 3DS may be one of the most sophisticated portable consoles released so far, this little gem is as basic as it gets, and that is part of it's charm. 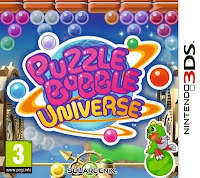 For the uninitiated, Puzzle Bobble features characters from the classic 80's Taito platformer Bubble Bobble. This time around the gameplay involves matching bubbles of the same colour, get three or more of the same colour in a row and they will burst, however, there is added jeopardy as the ceiling above the bubbles gradually moves down, and if the remaining bubbles get pushed below a marker at the bottom of the screen, the game is over. As well as the need to burst all the bubbles on the screen, you also need to collect keys in order to rescue your friends who have been captured. Although it's a fairly basic puzzle game, the visuals are really nice. As you play the game, the backgrounds give the effect of orbiting a planet, and as you burst the bubbles, the sense of 3D as they leap up from the screen and then fall hurtling toward the planet below is pretty neat. When you get to the end of each planet, you face off against a boss character which is a nice change of pace and adds a bit of variety to the gameplay. Like many of the initial launch titles, as the second wave of titles is released, this game is now available at a knock down price. 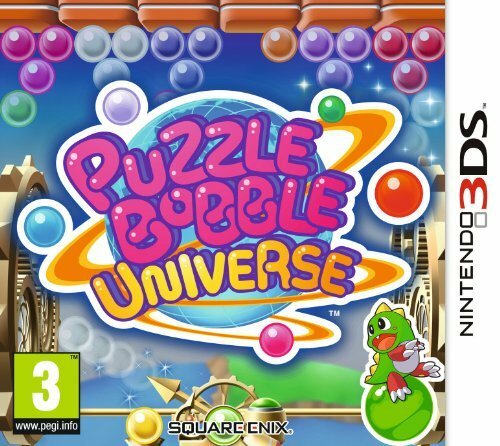 So if you want a fun, addictive puzzle game for your 3DS, look no further.